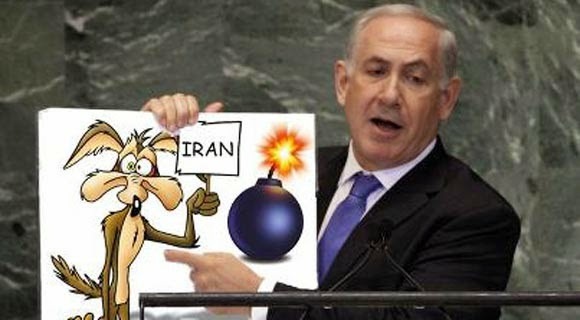 Bibi Netanyahu’s annual dog-and-pony show ambled into UN General Assembly today as he made yet another bombastic, hectoring speech assaulting Iran for its alleged sins of omission and commission. Like the shambling history professor his father was, he trots out audio-visual aids to reinforce his major argument and they invariably resemble the cartoon exploding cannonball he utilized a few years ago. This year, he exposed a “secret atomic warehouse” in Tehran which held “300 tons of nuclear-related equipment and material” used in Iran’s former program. He also claimed, somewhat preposterously, that the Iranians, desperate to erase their tracks, removed 15 kilograms of radioactive material and spread it in the streets of the city. If they did so, it would be incredibly easy to detect the radioactivity. Further, Iran has numerous sites where it stores such material, in total accord with the JCPOA agreement. Why it would need to smear the streets of Tehran with radioactivity is beyond me and beyond belief. Keep in mind these are two official in the Trump administration, which hates Iran as much or more than Bibi himself. Even they’re unimpressed. But even if we credit Netanyahu’s report as being true, there is absolutely nothing wrong with Iran storing equipment or even radioactive material in a warehouse. They point is not to be using it to enrich uranium or build a nuclear weapon. There is nothing in the JCPOA saying Iran must destroy every piece of equipment it once used to in such a program. Being a historian’s son doesn’t mean Bibi is a historian. In fact, I’ve regularly exposed the shambles he makes of Jewish history. Each year Bibi opens his bag of tricks and tries to outdo himself. And like the Oscar movie awards show, each year the audience shrinks. At first, there was the novelty of it. But after he pulled that first rabbit out of his hat and the audience oohed and ahhed, the shock wore off. By now, he’s long-since jumped the shark. Hardly anyone cares except Israelis. And many of them must be bored with it by now. Graphic artists had such fun with Bibi’s exploding cannon ball that I’d hoped they’d go to town with his “atomic warehouse” meme. I imagined someone photoshopping the image of him holding up a map of the warehouse site and replacing it with a board game called “Bibi’s Atomic Warehouse!” An alternate take on the subject would be Bibi holding up a similar map image, except it would show the IDF headquarters, the Kirya, in the heart of Tel Aviv. The caption should read: “Israel’s Not-So-Secret Atomic Warehouse.” Because of course, as Iran’s foreign minister tweeted above, Israel’s nuclear arsenal is no secret. Israel’s refusal to join the Non Proliferation Treaty is also public record. Compared to Israel, Iran is almost a choir boy with regard to its nuclear ambitions: it has no nuclear weapons, has abided by the terms of JCPOA, and is an NPT signatory. Israel? Not so much. I have a question for you, Richard. Most of us already know that Israel has nuclear weapons and they are not openly disclosed. Isn’t this refusal by Israel to be a signatory illegal due to their refusal to sign the nuclear non proliferation treaty? Isn’t that a violation of international law? If so, why aren’t countries like Iran or even the Palestinians working to get definitive proof of Israel’s possession of nuclear weapons and using this in their ICC proceedings? In addition, wouldn’t Israel’s possession of nuclear weapons without being a treaty signee be a violation of US law that says non-treaty nations cannot receive US financial support if they don’t sign the treaty? If so, why isn’t this being pressed in US courts where judges are more likely to rule against Israel than our elected officials? To me, these seem like such obvious and powerful ways to fight back against their belligerence in the region and their ethnic cleansing of the Palestinian people and yet it isn’t being acted upon. Your insight on this would be appreciated. Iran is pouring men and material into Syria. Why? The war’s over, right? Now’s the time Iran should be taking a victory lap and bringing the boys home. But that’s not happening. And what about all those precision missiles in Syria. Who are they aimed at? Syria’s defeated rebels? ISIS. @ Liam: I don’t know that it’s “illegal” to have WMD and not acknowledge it if you’re not an NPT signatory. It would be great if that was so. But I’ve never heard that it is. I’m not aware enough of the details of the NPT treaty to know whether nations refusing to join who have nukes are deprived of U.S. aid. I seem to recall hearing about such a protocol. Obviously, the U.S. has ignored it if it does exist, just as we deliberately ignored the theft of enriched uranium stolen by Arnon Milchan and his buddies working on behalf of the Mossad. But yes, that is a good point and another means of leverage and argument in attacking the issue of Israeli proliferation and the dangers it brings. @ Li Hing Lo: Is the war over? Largely over, yes. But over? I think not. As for your advice to Iran, I will make sure it gets to the proper authorities there and I’m sure they’ll appreciate your suggestions as to how they should pursue their national interests. I know for a fact they’ll say that your input is always appreciated. I don’t know what “boys” you’re talking about. Iran has a limited number of its own troops there. Hezbollah has troops there as well which it has been talking about withdrawing. There are other Shiite militias in Iran as well. I don’t know what they’re doing. FOr all I know, they may be withdrawing. But the key issue here is the long term. Israel never wanted Assad to survive. IT still doesn’t want him to survive. If it had its druthers, Syria would devolve into a group of statelets controlled by individual warlords. So what happens if Iran withdraws, Russia withdraws, Hezbollah withdraws? Do we really think the Sunni meddlers in Saudi Arabia, UAE, etc. will leave well enough alone and refrain from intervening once again? Not to mention Israel’s tendency to meddle in the affairs of its neighbors as well. So no, I don’t think Assad wants his friends to leave him to his fate. I think he wants a cushion guaranteeing his reign and the stability of his country. That’s why Iran will probably maintain a presence. Now if you’d like to talk to your buddies in the Kirya and PMO and MBS about guaranteeing non-interference in the affairs of Syria, I’m sure the Iranians and Syrians would be interested. Oh, and maybe you can put in a word for the return of the Syrian Golan which Israel conquered and illegally occupies. Then, long term peace and stability between the 2 countries would be guaranteed. How about it? How about you discuss the Iranian missiles in Syria. In whose direction are they being pointed? As you well know, ground to ground missiles are not defensive weapons. I’m done commenting on this thread. @ Li Hing Lo: How about you not tell or ask me to respond to any challenges you offer. I don’t owe you any answers or anything else and don’t suggest that I do. As for Iran’s missiles and where they’re pointed: where do you think all those Arrow 3s and Jericho ICBMs are pointed? Not to mention the nuclear armed Dolphins patrolling in the Red and Arabian Seas? At Riyadh? No, they’re pointed at Tehran. So when you get those missiles pointed elsewhere, I think you can ask Iran to point its missiles elsewhere. Not to mention that the Israeli weapons are WMD capable of destroying all of Iran, while Iran’s missiles are entirely conventional and no match for Israel’s. YOu are done commenting in this thread. He called it “somewhat misleading”. I’m sure you know there is a difference, so why are you misleading us, your readers? @ Jen: I’m sure you know you’re a troll. Why are you wasting everyone’s time posting such nonsense?